"Say Say Say" is a song written and performed by Paul McCartney and Michael Jackson, released in 1983. The track was produced by George Martin for McCartney's album, Pipes of Peace. The song was recorded during production of McCartney's 1982 Tug of War album, about a year before the release of "The Girl Is Mine", the pair's first duet from Jackson's album Thriller (1982). After its release in October 1983, "Say Say Say" became Jackson's seventh top-ten hit inside a year. It was a number one hit in the United States, Canada, Norway, Sweden, and several other countries, reached number two in the United Kingdom, and peaked within the top ten in Australia, Austria, New Zealand, The Netherlands, Switzerland, and over 20 other nations. In 2013, Billboard magazine listed the song as the 41st biggest hit of all-time on the Billboard Hot 100 charts. It has also been voted the ninth best collaboration of all time in a Rolling Stone readers poll. The single was certified gold by the Recording Industry Association of America in December 1983, representing sales of one million copies. The single was promoted with an influential music video directed by Bob Giraldi. The video, filmed in Santa Ynez Valley, California, features cameo appearances by Linda McCartney, La Toya Jackson, Harry Dean Stanton and Giraldi. The short film centers around two con artists called "Mac and Jack" (played by McCartney and Jackson). McCartney biographer Ray Coleman asserted that the majority of the song's lyrics were written by Jackson and given to McCartney the next day. Recording began at AIR Studios in London in May 1981. At the time, McCartney was recording Tug of War, the former Beatle's first solo album after the breakup of his group Wings. Jackson stayed at the home of McCartney and his wife Linda during the recording sessions, and became friends with both. While at the dining table one evening, Paul McCartney brought out a booklet that displayed all the songs to which he owned the publishing rights. "This is the way to make big money", the musician informed Jackson. "Every time someone records one of these songs, I get paid. Every time someone plays these songs on the radio, or in live performances, I get paid." McCartney's words influenced Jackson's later purchase of ATV Music Publishing in 1985. McCartney played several instruments on "Say Say Say", including percussion, synthesiser, guitar, and bass guitar. The harmonica was played by Chris Smith and the rhythm guitar was played by David Williams. The song was engineered by former Beatles sound engineer, Geoff Emerick. The production of "Say Say Say" was completed in February 1983, after it had been refined and overdubbed at Cherokee Studios in California. George Martin, who had worked with The Beatles, produced the song. He said of his experience with Jackson, "He actually does radiate an aura when he comes into the studio, there's no question about it. He's not a musician in the sense that Paul is ... but he does know what he wants in music and he has very firm ideas." Jackson also spoke of the experience in his autobiography, Moonwalk. The younger singer revealed that the collaboration boosted his confidence, as Quincy Jones—producer of Thriller—was not present to correct his mistakes. Jackson added that he and McCartney worked as equals, stating, "Paul never had to carry me in that studio." According to Musicnotes.com by Alfred Music Publishing, "Say Say Say" was performed in common time, with a dance beat of 116 beats per minute. It is in the key of B♭ minor and sung in a vocal range from F3 to B♭4. The lyrics to "Say Say Say" reflect an attempt to "win back" a girl's affection; Deseret News considered the song to be a "pleading kind of love song". 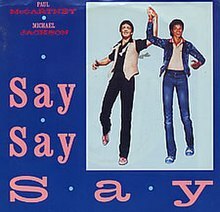 Following the release of Thriller and most of its singles, "Say Say Say" was released on 3 October 1983 by Parlophone Records in the UK and Columbia Records in the US. It remained atop Billboard's Hot 100 for six weeks and became Jackson's seventh top ten hit of 1983, breaking a record that until then was held jointly by The Beatles and Elvis Presley. Also in the US, "Say Say Say" reached number two on the R&B chart (behind "Time Will Reveal" by DeBarge) and number three on the Hot Adult Contemporary Tracks chart. Although the song had peaked at number ten in the UK, it began to fall steadily; McCartney subsequently held an early weekday live television interview, where he discussed the song's music video. This, along with screenings of the video on Top of the Pops (which normally played only singles that were rising in the charts), The Tube and Noel Edmonds' The Late, Late Breakfast Show, helped propel the song to number two on the UK Singles Chart. "Say Say Say" reached number one in Norway and Sweden, and the single also reached the top ten in Austria, Australia, New Zealand, the Netherlands, and Switzerland. With wholesale shipments of at least one million units, the single was later certified platinum by the Recording Industry Association of America. "Say Say Say" received mixed reviews from music critics. The lyrics were named the worst of 1983 by The Buffalo News's Anthony Violanti, while the Lexington Herald-Leader stated in a review of Pipes of Peace that, aside from "Say Say Say" and "The Man", "McCartney waste[d] the rest of the album on bathos and whimsy". The Los Angeles Times' Paul Grein also reviewed the McCartney album and opined that the singer had redeemed himself with the success of the "spunky" song "but plunged back into wimpdom with 'No More Lonely Nights'". Journalist Whitney Pastorek compared the song to McCartney's 1982 duet with Stevie Wonder, "Ebony and Ivory". She asserted that "Say Say Say" was a better song, and had a better "though slightly more nonsensical" music video, adding that the song had no "heavy-handed social content". Penn State's The Daily Collegian described the track as a good song, despite its ad nauseam broadcasts. Deseret News stated that the "pleading love song" had a "masterful, catchy hook". In a Rolling Stone review, the track was described as an "amiable though vapid dance groove". The reviewer, Parke Puterbaugh, added that it was an "instantly hit-bound froth-funk that tends, after all, toward banality". Music critic Nelson George stated that "Say Say Say" would not have "deserved the airplay it received without McCartney and Jackson". Salon.com later described the song as a "sappy duet". The online magazine concluded that McCartney had become a "wimpy old fart". Billboard listed "Say Say Say" as Michael Jackson's all-time biggest Hot 100 single. In a 2007 article, a writer for the magazine Vibe listed "Say Say Say" as the 22nd greatest duet of all time. The writer commented that the song was "a true falsetto fantasy" and that it was "still thrilling to hear the sweet-voiced duo trade harmonies on the chorus". In 2005, Dutch musicians Hi Tack sampled "Say Say Say" on their debut single, "Say Say Say (Waiting 4 U)". The song featured Jackson's vocals from the original recording, plus McCartney's "Baby". On October 6, 2015, McCartney released a new version of the song in which the vocal roles of him and Jackson are reversed. It was remixed by Steve Orchard and Mark "Spike" Stent. On the new version, which is over three minutes longer than the original, the opening of the first is sung by Jackson instead of McCartney. Orchard said of the remix: "Paul remembered that there were two unused lead vocal performances by Michael and himself. We rearranged the vocal sequence and inverted the original performance so that Michael opened the first verse instead of Paul, to give the song a different take to the original version." More specifically, Jackson sings the parts that McCartney had in the original, and vice versa, for much of the song. The track appears on the 2015 re-issue of Pipes of Peace. A radio edit of the 2015 remix was released for streaming on October 30, 2015, while an instrumental version of it is available for download at paulmccartney.com. To coincide with the release of the recording, McCartney released a new music video on his Facebook page on October 6, 2015. Directed and choreographed by Ryan Heffington, it featured a group of young dancers, filmed in black and white in Los Angeles neighbourhoods, with moves that are reminiscent of Michael Jackson's. The music video (or "short film") for "Say Say Say" was directed by Bob Giraldi, who had previously directed Michael Jackson's music video for "Beat It". Cameo appearances in the video are made by McCartney's then wife Linda, as well as Jackson's older sister La Toya, and actor Harry Dean Stanton. According to LaToya Jackson, during filming of the video, the McCartneys were staying at a property named Sycamore Valley Ranch, five miles from the town of Los Olivos, California in the Santa Ynez Valley. Jackson visited them and expressed interest in someday buying the property. In 1988, he would do so, renaming it Neverland Ranch. To accommodate Jackson's busy schedule the video was filmed at Los Alamos near Santa Barbara, California and at the Sycamore Valley Ranch. The saloon portion was filmed at the 1880 Union Hotel in Los Alamos. McCartney flew in specifically for the filming. The video cost $500,000 to produce. The British television premiere of the video was highly controversial. The video had not been ready when the track debuted in the UK singles chart. By the time it was finalised, the track had dropped in the chart. McCartney flew to London to premiere the video on the BBC1 TV show Top Of The Pops, but the show had a strict policy that no single that had dropped in position could feature on the programme and refused to show it. A furious argument ensued, with claims McCartney threatened to withdraw all his music from the corporation. As a compromise, the BBC offered to air the video two days later on The Late, Late Breakfast Show hosted by Noel Edmonds, a variety show that featured live music performances, but rarely aired videos. They agreed to show it on the programme only if McCartney appeared live and gave an interview. He reluctantly agreed and appeared with his wife Linda live on the show on Saturday, 29 October 1983; his first live UK TV appearance since 1973. The interview was stilted and the McCartneys made little or no effort to answer any of Edmonds' questions. After some reportedly hostile negotiations, the programme's entire show was built around the 'medicine men' theme of the video and the guest who had been booked to appear that week Olivia Newton-John had to agree to appear to promote the video in a skit, reportedly against her will and she expressed anger at having her 'starring' role in the show downgraded into a lesser guest spot to make way for the video and McCartney. The airing of the video on this highly rated show was successful as the track climbed back up the chart the following week and aired on Top Of The Pops on Thursday, 4 November 1983. The video also features appearances by director Giraldi as a pool shark who is conned by McCartney and Art Carney as an audience member for the vaudeville show. Giraldi said of Jackson and McCartney, "Michael didn't outdance Paul, and Paul didn't outsing Michael". He added that production of the video was hard work because "the egos could fill a room". The video introduced both dialogue and storyline, an element extended upon in Michael Jackson's Thriller. In a 1984 study of music videos conducted by the National Coalition on Television Violence, the Jacksons were rated "very violent," citing Michael Jackson's "Billie Jean," "Thriller", and "Say Say Say" as well as Jermaine Jackson's "Dynamite" and the Jacksons' "Torture." In a list compiled by Billboard at the end of 1984, the music video was named the fourth best of the year, and the rest of the top four were also short films by Jackson. The Manchester Evening News later described the "Say Say Say" video as an "anarchic caper" that "plays out like an Emir Kusturica feature". PopMatters stated that the music videos of "Say Say Say" and "Goodnight Tonight" turned "a pair of otherwise forgettable songs into something worth watching". Steven Greenlee of The Boston Globe reflected that the video was both "horrifying and compelling", and stated the ridiculousness of a potion which could aid Jackson in beating somebody at arm wrestling. He added, "It's even harder to believe that the two of them didn't get the pulp beaten out of them in that bar for dressing like a pair of Chess King employees". The "Say Say Say" video was later included on the DVDs The McCartney Years and Michael Jackson's Vision. Two authors later reviewed the short film and documented two central themes. The first is a "Child/Man" theme; the role of both a boy and an adult, which writer James M. Curtis states Jackson plays throughout the music video for "Say Say Say". Curtis writes that the bathroom scene involving the shaving foam is reminiscent of boys copying their fathers. He adds that the scene marks "the distinction between Michael's roles as a Child and as a Man". The writer also highlights the part where the singer supposedly becomes strengthened with a miracle potion, a further play on the "Child/Man" theme. Furthermore, Curtis observes that Paul and Linda McCartney seem to act as if they are Jackson's parents in the short film. The author also notes that in a scene where Jackson is handed a bouquet of flowers from a girl, it is a reversal of one from City Lights, a 1931 film starring Charlie Chaplin, whom the singer greatly adored. The second of the two main themes in the music video is of African American history and culture, as some of the vaudeville scenes in the short film acknowledge minstrel shows and blackface. Author W. T. Lhamon writes that the video is set in the Californian Depression, and that McCartney and Jackson "convey a compactly corrupt history of blackface" as they con their way to riches with the Mac and Jack show. Lhamon was critical of the pair and of the video because he felt that the African American theme had not been made explicitly known. The author expressed his view that aspects of the short film were historically out-of-synch with interracial relations. He stated, "Nearly everything in the video is backward. Mack's white hand continually helping black Jack on board, for instance, reverses the general process I have shown of blacks providing whites with their sustaining gestures." Lhamon added, "In a just world, Jackson should be pulling McCartney onto the wagon, not the other way around." ^ "Greatest of All Time Hot 100 Singles". Billboard. Retrieved 7 September 2016. ^ a b c "Say Say Say – Paul McCartney Digital Sheet Music (Digital Download)". MusicNotes.com. Alfred Publishing Co. Inc.
^ a b "McCartney, Jackson together again". Deseret News. 18 November 1993. Retrieved 7 March 2009. ^ a b c "Austrian Singles Chart Archives". austriancharts.at. Hung Medien. Retrieved 3 March 2009. ^ Violanti, Anthony (18 August 1996). "Schlock: An Unusually Confused and Nasal Dylan". The Buffalo News. Retrieved on 19 March 2009. ^ "Paul McCartney's New Album Is Just 'Embarrassing Fluff'". Lexington Herald-Leader. (15 January 1983). Retrieved on 19 March 2009. ^ Grein, Paul (3 January 1988). "Hits That Hurt In Some Cases, That Top 10 Smash Can Smash an Artist's Image". Los Angeles Times. Retrieved on 19 March 2009. ^ Pastorek, Whitney (3 May 2007). "This Week in '82". Entertainment Weekly. Retrieved 19 March 2009. ^ Yeany, Ron (22 November 1990). "McCartney and Simon". The Daily Collegian. Retrieved 2 March 2009. ^ Puterbaugh, Parke (19 January 1984). "Pipes of Peace review". Rolling Stone. Retrieved 7 March 2009. ^ George, Nelson (22 December 1984). "Black '84". Billboard. 96 (51). ISSN 0006-2510. Retrieved 11 February 2010. ^ Garcia, Gilbert (27 January 2003). "The ballad of Paul and Yoko". Salon.com. Archived from the original on 19 June 2009. Retrieved 7 March 2009. ^ "'Say Say Say' ranks as Michael Jackson's biggest Billboard hit". Retrieved 12 April 2016. ^ Caramanica, Jon (February 2007). "The 50 greatest duets of all time". Vibe. Retrieved 11 February 2010. ^ "Sir Paul McCartney Switches Vocals with Michael Jackson in Remixed Duet". ^ "Must Hear: New 'Say Say Say' – Michael Jackson World Network". 2 October 2015. ^ "Song of the week: Paul McCartney and Michael Jackson, together again". ^ a b "Say Say Say (Radio Edit / 2015 Remix)". 16 October 2015. ^ "Paul McCartney Revives Michael Jackson in Video for 'Say Say Say' Remix". 6 October 2015. ^ "Watch the new 'Say Say Say [2015 Remix]' video". 6 October 2015. ^ "Linda McCartney Dies Of Cancer". MTV. 20 April 1998. Retrieved 8 March 2009. ^ La Toya Jackson; Jeffré Phillips (29 May 2012). Starting Over. Simon and Schuster. p. 69. ISBN 978-1-4516-2059-7. Retrieved 12 May 2016. ^ SUAREZ, JONATHAN (1 February 2010). PASSED AWAY. Lulu.com – via Google Books. ^ "The Historic Saloons of Central California". ^ Morris, Davina (24 August 2008). "Happy birthday MJ". The Voice. Archived from the original on 14 January 2013. Retrieved 8 March 2009. ^ Paul McCartney (2007). The McCartney Years (DVD). Rhino Entertainment. ^ Garcia, Guy (18 November 1983). "People: Nov. 14, 1983". Time. Retrieved 8 March 2009. ^ Sklar, Ron (23 November 1990). "Thriller video". The Daily Collegian. Retrieved 8 March 2009. ^ Bishop, Pete. "Group on TV Violence Looks at Music Videos and Is Not Amused" Chicago Tribune, 25 January 1985. ^ Gilliver, Stephen (20 November 2007). "DVD review: Paul McCartney – The McCartney Years (Warner)". The Manchester Evening News. Retrieved 8 March 2009. ^ Lawson, Terry (20 November 2007). "Old rockers go on a DVD roll". PopMatters. Retrieved 8 March 2009. ^ Greenlee, Steven. "Back when MTV had videos". The Boston Globe. Retrieved 16 March 2009. ^ "Ultratop.be – Paul McCartney & Michael Jackson – Say Say Say" (in Dutch). Ultratop 50. ^ "Offizielle Deutsche Charts". www.offiziellecharts.de. Retrieved 27 April 2016. ^ "The Irish Charts". www.irishcharts.ie. Retrieved 27 April 2016. ^ "Hit Parade Italia – Indice per Interprete: M". Hit Parade Italia. Retrieved 6 July 2012. ^ "Dutch Charts". www.dutchcharts.nl. Retrieved 27 April 2016. ^ "New Zealand Charts". www.charts.org.nz. Retrieved 27 April 2016. ^ "VG Lista". www.norwegiancharts.com. Retrieved 27 April 2016. ^ "SA Charts 1965 – March 1989". Retrieved 5 September 2018. ^ "Swedish Charts". www.swedishcharts.com. Retrieved 27 April 2016. ^ "Swiss Charts". www.hitparade.ch. Retrieved 27 April 2016. ^ Whitburn, Joel (1993). Top Adult Contemporary: 1961–1993. Record Research. p. 118. ^ "Top 100 Singles of 1984 – Volume 41, No. 17, January 05 1985". RPM. Library and Archives Canada. Archived from the original on 2016-05-09. Retrieved May 21, 2018. ^ "Top 20 Hit Singles of 1984". Retrieved 26 December 2018. ^ "Top 100 Songs of 1984 – Billboard Year End Charts". Bob Borst's Home of Pop Culture. ^ "Canadian single certifications – Paul Mccartney – Say, Say, Say". Music Canada. ^ a b "Les Certifications (Albums) du SNEP (Bilan par Artiste) > McCARTNEY Paul & JACKSON Michael > "Ok" (in French). InfoDisc.fr. Archived from the original on 2014-10-30. Retrieved 2015-07-22. ^ "British single certifications – PAUL McCARTNEY & MICHAEL JACKSON – Say, Say, Say". British Phonographic Industry. Select singles in the Format field. Select Silver in the Certification field. Type Say, Say, Say in the "Search BPI Awards" field and then press Enter. ^ "American single certifications – MC CARTNEY, PAUL AND MICHAEL JACKSON – Say Say Say". Recording Industry Association of America. If necessary, click Advanced, then click Format, then select Single, then click SEARCH. Coleman, Ray (1996). McCartney: Yesterday and Today. Dove Books. ISBN 0-7871-1038-8.